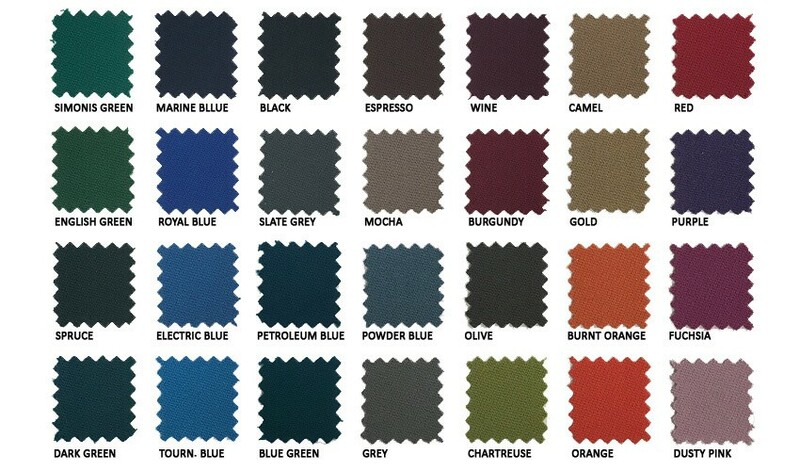 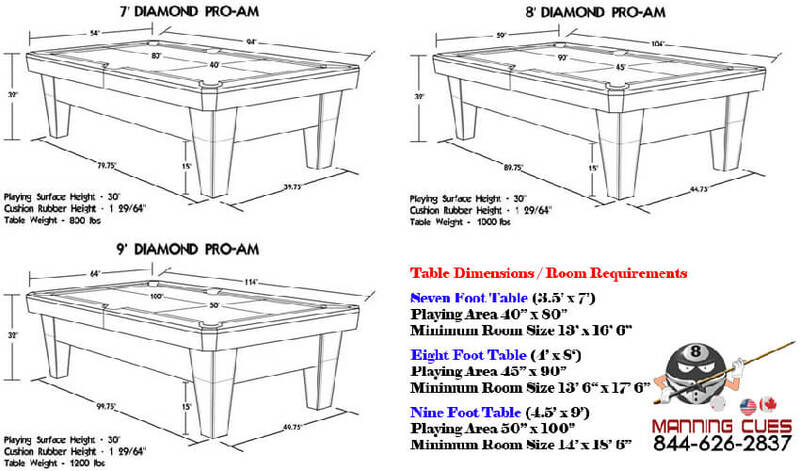 Please use the chart below to select your table size and make sure it will fit in your room. 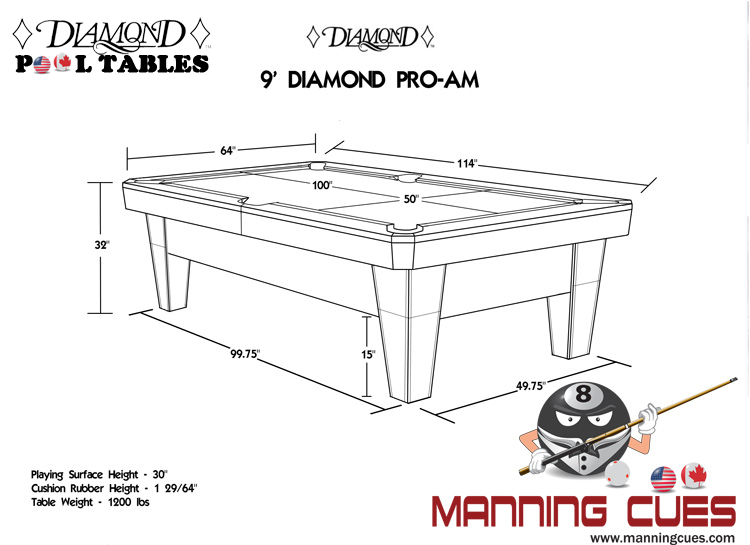 Give Manning a call if you want to discuss this in detail. 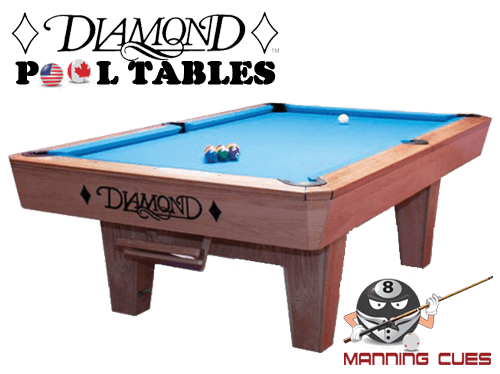 The Diamond Smart Table is available in Oak, Maple, PRC and Dymalux. 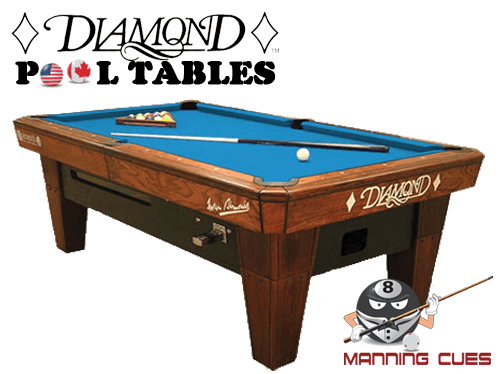 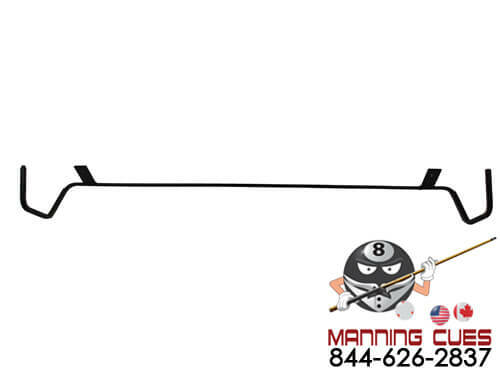 Each Diamond Pro AM table comes with two Routed Diamond Logo's on each end of the table. 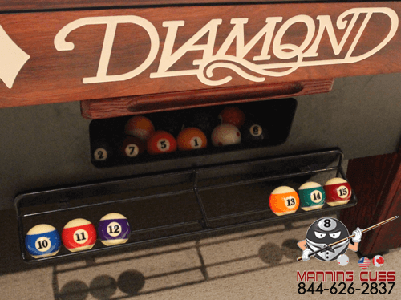 These logos are filled with black or white epoxy to allow the logo to stand out or blend into the tables finish. 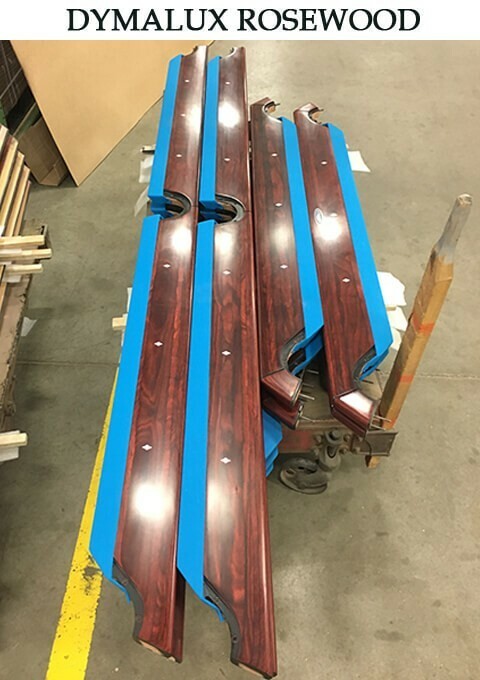 IMPORTANT: The white logo is only available on PRC and Dymalux tables as there is no stain to penetrate the white epoxy. 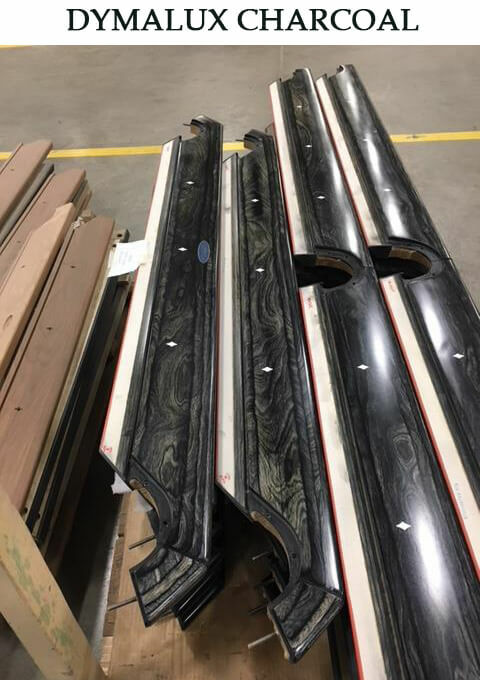 If you were to select a white epoxy with a stained table the stain would bleed into the epoxy and you would have a swirl effect. 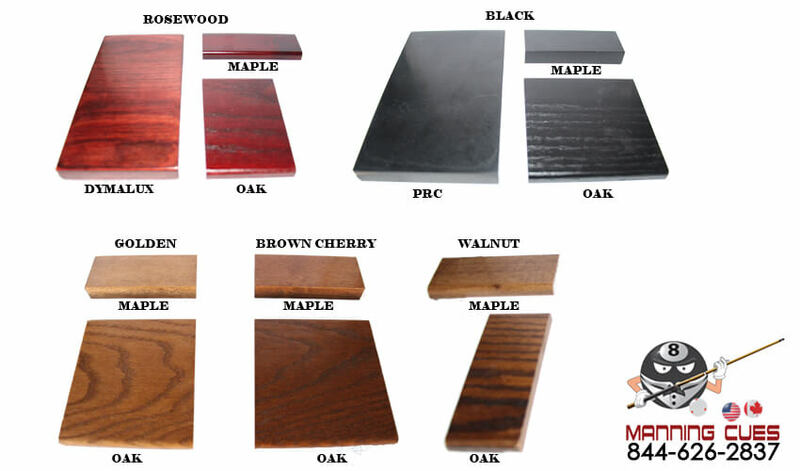 We're sure you don't want a beautiful rosewood finish table with a white logo turning pink swirl ! 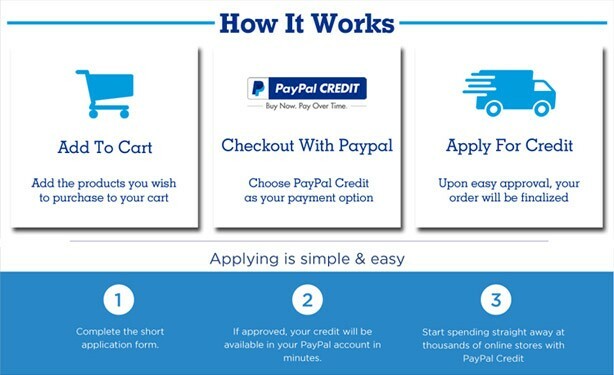 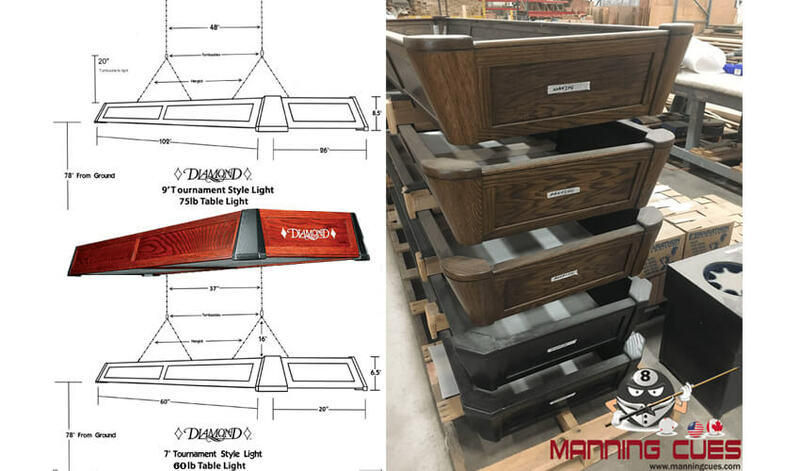 When you call Manning you can discuss this in detail and make sure you know exactly what you're getting an how it will look. 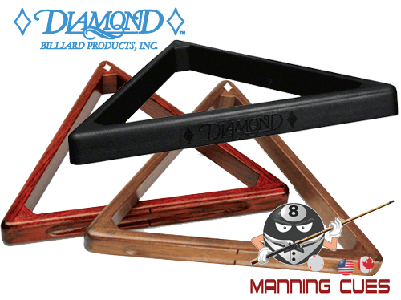 Diamond Bridge hooks have a clear rubber coating so when you put the bridge stick down to rest it quite and no dings or dents damage your bridge stick. 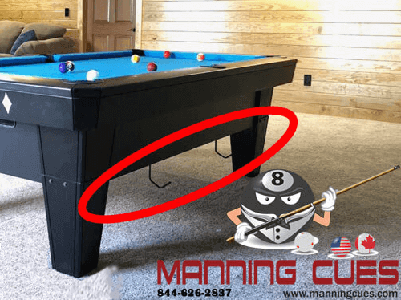 The Bridge hook easily mounts to the belly of the table with 4 screws leaving your bridge at an arm's length, tucked back not to interfere with regular play. 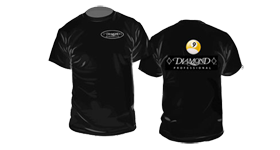 Available for one or both sides of the table. 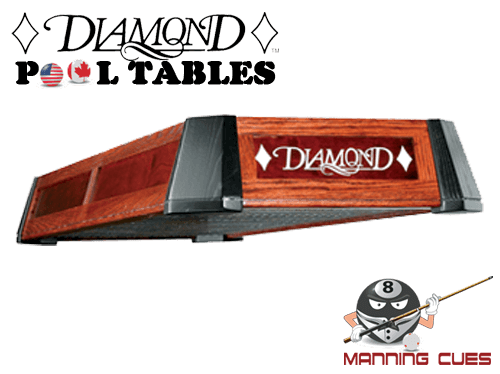 If you want your bridge to be on your table this is the one an only option designed specifically for Diamond Tables. 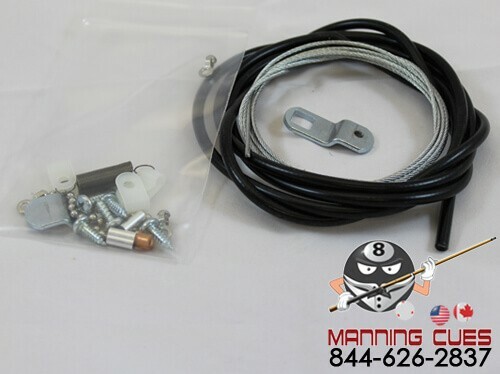 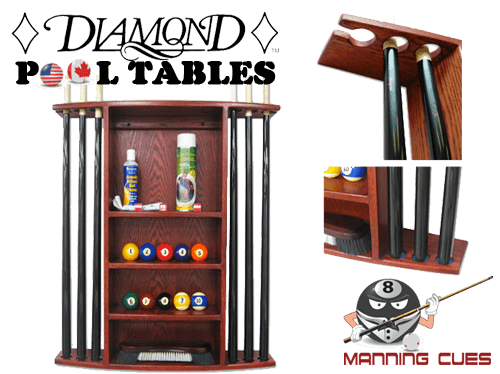 The Diamond Wire Ball Holder allows you to conveniently store balls under the ball collector. 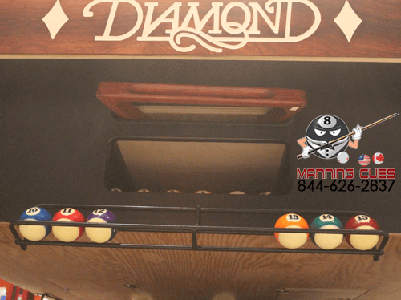 The picture shows you the strip balls resting in the wire holder when playing 9 ball so the balls are not mixed every game making it easy to remove only the balls you require for 9 ball. 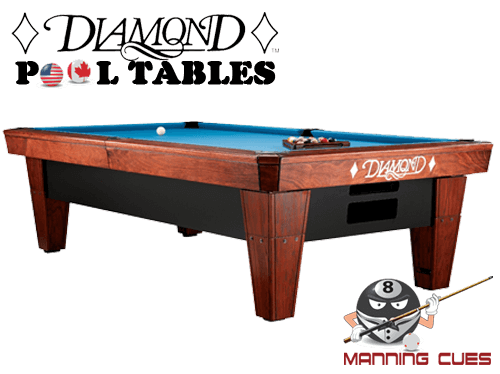 This collector also has a divider rail in the middle so you can easily keep score while playing one pocket. 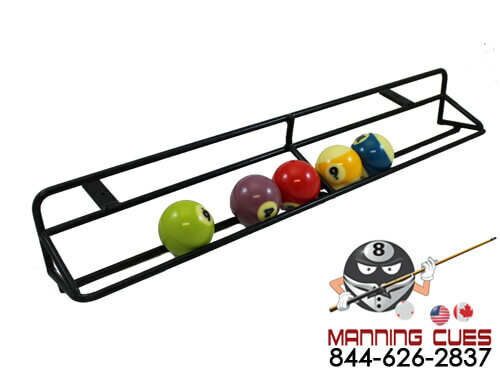 Each side will hold 9 balls and is easily mounted from under the tables belly with 4 screws. 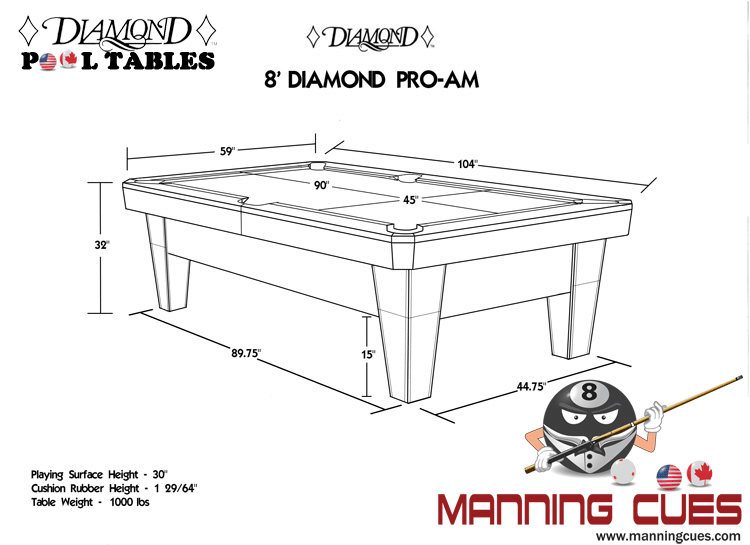 No mounting required to the side of the table so it remains in original condition. 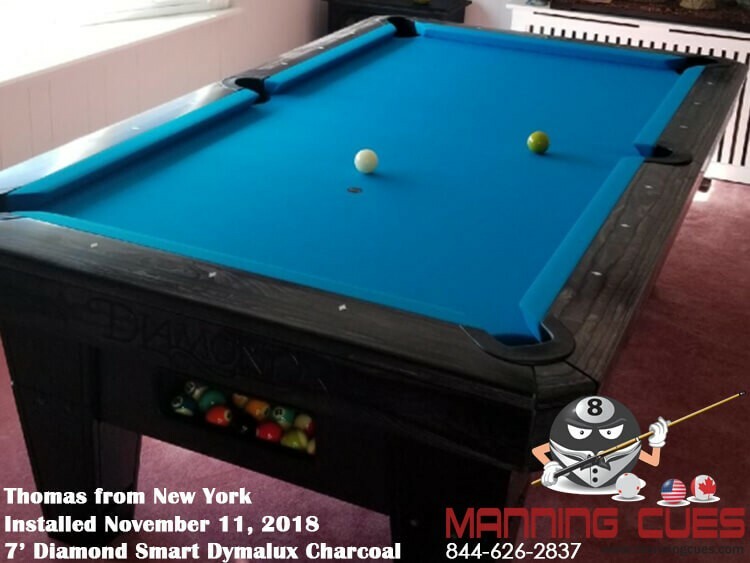 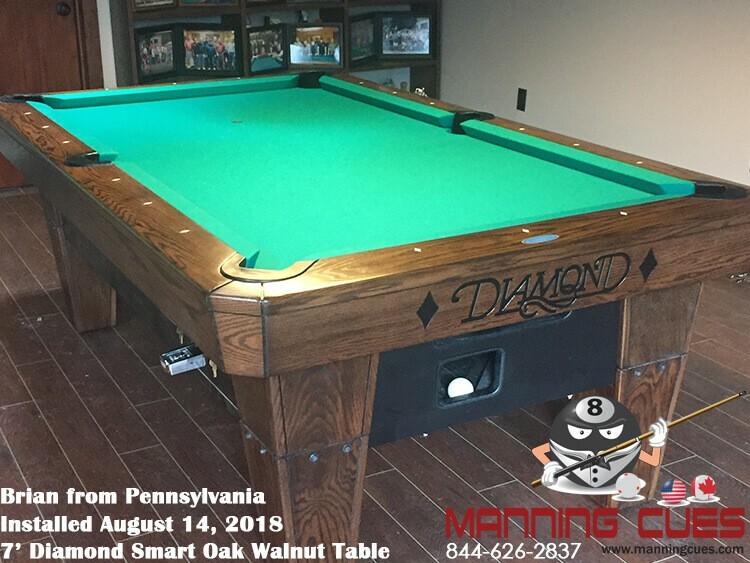 If you are looking for a coin-operated pool table that outperforms all the others, look no further, the DIAMOND SMART TABLE™ is unmatched in every aspect. 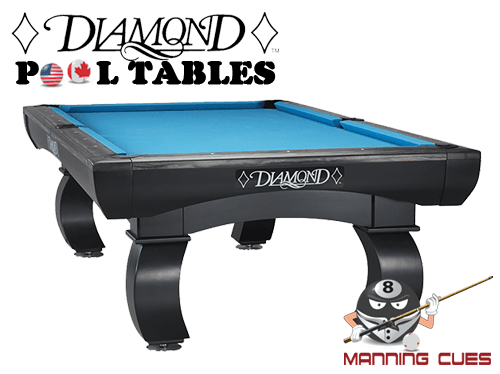 The combination of an attractive look and unsurpassed play-ability is the reason that DIAMOND SMART TABLES™ has quickly become the player’s choice. 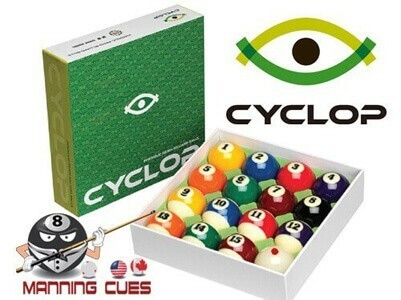 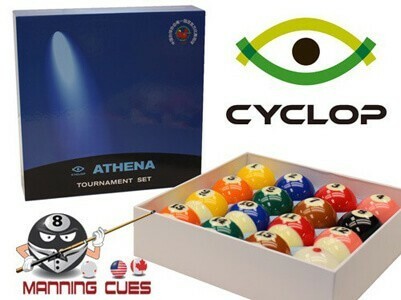 Patented optical density sensor built into the ball return system allows the player to use Cyclop Billiard Balls with the professional grade Cyclop Cue Ball. 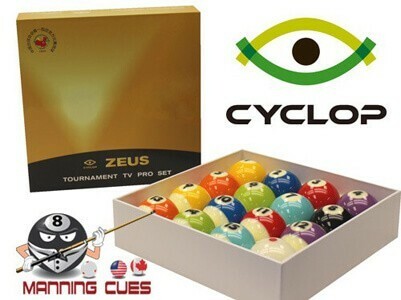 No longer do the amateurs have to play with an oversized or magnetic cue ball. 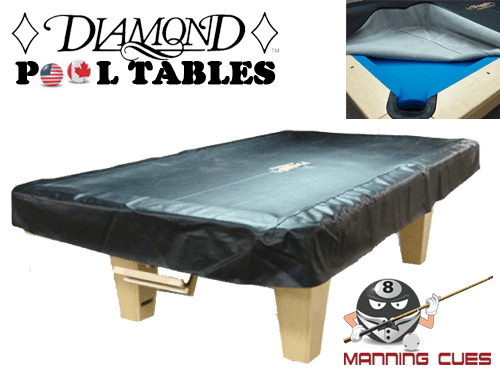 The DIAMOND Smart Table™ and the DIAMOND Pro-Am play exactly the same. 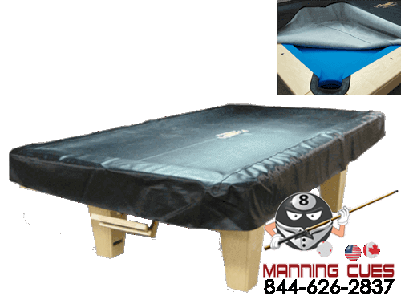 They have the same cushions, the same slate, the same pocket openings, the same leveling system, the same cloth, and the same rails. 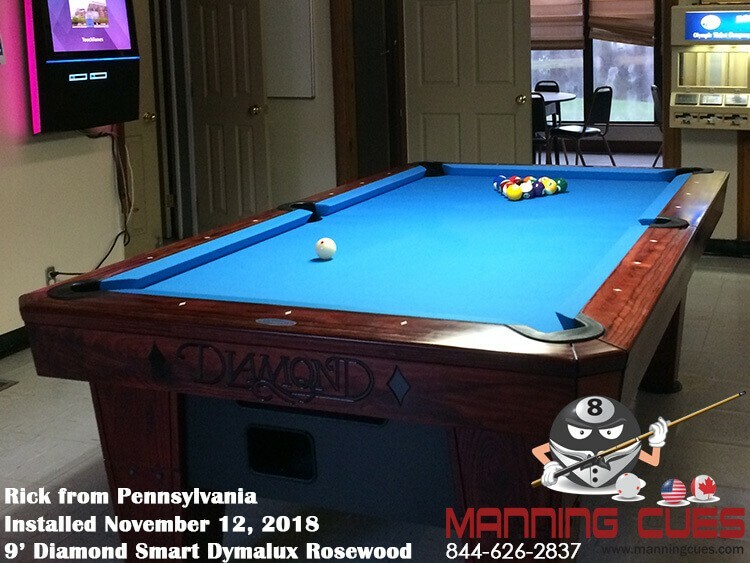 Below we list the features and benefits that make the Smart Table™ a better choice for prospective pool room owners. Both are also available in 7'. 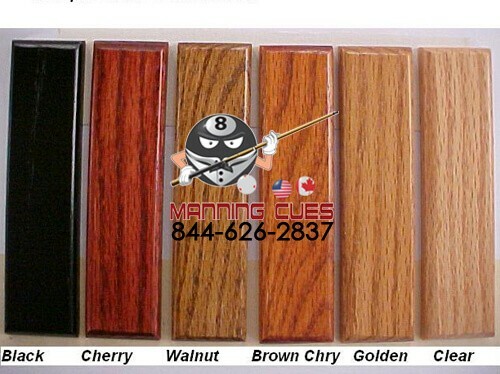 If shipping the table across the border into Canada Duties and Brokerage will be extra.